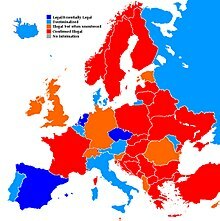 Legality of cannabis in Europe. Cannabis in Italy is legal for medical and industrial uses, although it is strictly regulated, while it is decriminalized for recreational uses. In particular, the possession of small amounts of marijuana for personal use is a misdemeanor and it is subjected to fines, as well as the suspension of personal documents (e.g. passports and driver’s licenses). Nevertheless, the unlicensed cultivation of cannabis, even if in small amounts and for exclusive personal use, is illegal and punishable with imprisonment, as is the unauthorized sale of cannabis-related products. The licensed cultivation of cannabis for medical and industrial purposes requires the use of certified seeds, however there is no need for authorization in order to plant certified seeds with minimal levels of psychoactive compounds (a.k.a. cannabis light). Advertisement for cannabis indica cigarettes in Bergamo, 1881.
the Neapolitan, small seeded variety, was cultivated in the same area of the large seeded variety. In the 1940s, Italy was believed to be the second-biggest producer of industrial cannabis in the world, after the Soviet Union, although statistics from China, another major producer, are not available. According to the national farmers association Coldiretti, almost 100 thousand hectares (i.e. 1000 km2) of farmland in Italy were dedicated to the production of cannabis at the time. The decline of hemp production in Italy came with the economic boom of the 1950s and 1960s, during which time synthetic fibers were introduced into the market and the international campaign against narcotics intensified. In particular, Italy endorsed all the three major drug control treaties, namely the Single Convention on Narcotic Drugs of 1961, the Convention on Psychotropic Substances of 1971, and the United Nations Convention Against Illicit Traffic in Narcotic Drugs and Psychotropic Substances of 1988, and soon after the passage of the anti-drug Cossiga Law 685/75 of 1975, hemp fields in Italy all but disappeared. In recent years, hemp production for medical and industrial purposes has seen a resurgence in Italy thanks to new technologies and innovative applications involving cannabis plants. In particular, hundreds of new businesses started growing cannabis in several Regions after looser requirements came into force in 2016 regarding the cultivation of cannabis plants with levels of THC below 0.2% (a.k.a. cannabis light), with the estimated cultivation area increasing from 400 hectares in 2013 to almost 4000 hectares (i.e. 40 km2) in 2018. Pro-legalization graffiti in Venice marking the cannabis leaf symbol as Erba Buona (i.e. good weed), and the symbol of the Northern League party as Erba Cattiva (i.e. bad weed). In 2006, the controversial Fini–Giovanardi Law 49/06 removed the distinction between hard and soft drugs, and until it was struck down by the Constitutional Court in 2014 the possession of marijuana and hashish was punishable as harshly as the possession of heroin or cocaine. In particular, the law tripled sentences for selling, cultivating, and possessing cannabis from 2-6 years to 6-20 years, leading to prison overcrowding, with 40% of inmates being jailed for drug-related crimes, although cannabis consumption was not criminalized. At present, the possession of cannabis for personal use is decriminalized and subjected to fines and the confiscation of personal documents like passports and driver’s licenses, while its unlicensed cultivation and sale are still illegal and punishable with imprisonment, although there have been cases in which followers of the Rastafari religion have been acquitted of possession charges on religious grounds. Nevertheless, according to a 2015 poll by Ipsos, 83% of Italians deem laws prohibiting soft drugs as ineffective, 73% are in favour of legal cannabis, and 58% think that legalization would benefit public finances. In terms of consumption, 25% of people aged 15 to 19 years old have admitted using cannabis for recreational purposes at least once in 2014. Moreover, according to a 2018 report by the European Monitoring Centre for Drugs and Drug Addiction, Italy ranks third in the European Union in terms of cannabis use. The popularity of recreational cannabis led in 2016 to renewed legalization efforts in Parliament, where legislation was proposed with the support of several politicians, mainly from the center-left Democratic Party, the left-wing Left Ecology Freedom party, the anti-establishment Five Star Movement, the anti-prohibition Radical Party, and even a few from the conservative Forza Italia party, as well as members of the Anti-Mafia Directorate. Proponents of the legislation point to the failure of prohibitionism in reducing cannabis consumption and argue that legalizing cannabis would regulate the circulation of cannabis-related products, reduce consumption among adolescents, allow the police and courts to focus their resources on other issues, and deprive criminal organizations of a significant source of revenue by redirecting it toward the State in the form of taxes, similarly to what happened in Colorado after it legalized cannabis in 2012. In particular, the value of the illegal cannabis market in Italy is estimated between 7.2 billion and more than 30 billion euros, while the potential tax revenue from legal cannabis is estimated between 5.5 and 8.5 billion euros. Moreover, the potential GDP boost resulting from a legal cannabis market in Italy is estimated between 1.30% and 2.34%. Nevertheless, legalization efforts were opposed by several conservative and catholic-leaning politicians, mainly from the Northern League party and the New Centre-Right party, who argued that the consumption of cannabis constitutes a health risk and that legalization will not reduce drug addiction. The PD-led coalition government at the time, of which the New Centre-Right was a partner, was mainly focused on ensuring the passage of constititutional reforms, therefore cannabis legalization was not considered a priority. After the defeat of the constitutional referendum and the subsequent resignation of Prime Minister Matteo Renzi on 12 December 2016, legalization efforts stalled in Parliament. In 2016, the “cannabis light” Law 242/16 removed the need for authorization to plant certified cannabis seeds with levels of THC below 0.2%, while the detection of THC levels between 0.2% and 0.6% during field inspections is still considered acceptable, when it can be attributed to natural causes. The law also requires farmers to keep the certification receipts for up to one year, however the use of cannabis leaves and inflorescences for edible products is still prohibited. The potential revenue from the sale of cannabis light in Italy is estimated to be more than 40 million euros, and by 2018 hundreds of new businesses started growing cannabis in several Regions. Even though these looser requirements were originally intended to benefit farmers growing industrial hemp, with the production being limited to the 64 varieties of industrial hemp certified by the European Union, a lack of clarity regarding the use of cannabis inflorescences effectively created a booming unregulated market for recreational light cannabis. Since the law does not explicitly prohibit the sale of hemp flowers, costumers can legally buy them, and then they can simply crumble them, roll them, and smoke them. The aforementioned 0.2% limit for the allowed THC content is considerably lower than the 15-25% range typically found in marijuana, thus preventing cannabis light users from actually getting stoned, however proponents of cannabis legalization are confident that the spread of cannabis light can contribute to the normalization of cannabis overall. Nevertheless, in September 2018, Interior Minister and Northern League party leader Matteo Salvini issued a memo to law enforcement agencies outlining a zero-tolerance policy towards cannabis retailers. In particular, the directive states that cannabis products that contain THC levels above 0.2%, or that are made from plants not included in the official list of industrial hemp varieties, must be considered as narcotics and thus confiscated. Moreover, the Superior Council of Health, which provides technical-scientific counsel to the Ministry of Health, recommended in April 2018 to stop the free sale of cannabis light, as a public health precaution. The Council argued that the industrial applications of cannabis, as envisaged in the Law 242/16, do not include cannabis inflorescences; and they also cited a lack of scientific studies on the effects of even small levels of THC on possibly vulnerable subjects such as older people, breastfeeding mothers, and patients suffering from certain pathologies, which prevents them form ruling out possible health risks. In 2019, a team of economists from the University of Magna Graecia, Université Catholique de Louvain, and the Erasmus School of Economics published a study on the effect of light cannabis liberalization in Italy on the organized crime. Albeit light cannabis does not generate hype as illegal marijuana, the study showed that confiscations of illegal marijuana declined with the opening of light cannabis shops. The authors also found a reduction in the number of confiscations of hashish and plants of marijuana along with a reduction of arrests for drug-related offenses. Forgone revenues for criminal organizations were estimated to be at least 90–170 million euros per year. Lifetime prevalence of cannabis use among all adults aged 15 to 64 years old, in nationwide surveys among the general population of Europe. Cannabis inflorescences are classified as narcotics and their pharmaceutical use is strictly regulated in accordance with the aforementioned UN Conventions of 1961 and 1971, EU regulations, as well as national legislation, including the Presidential Decree DPR 309/90 of 1990. The cultivation of cannabis plants for pharmaceutical use, as well as the production and distribution of cannabis-based medicine, are allowed only for authorized entities, while the DPR 309/90 forbids both the direct and indirect advertisement of a list of derived substances. Nevertheless, farmers can cultivate cannabis for exclusively non-pharmaceutical purposes, such as the production of hemp fibers or other industrial applications, using certified seeds under the direction of the Ministry of Agricultural, Food, and Forestry Policies. determining the production quotas based on Regional requests, and relaying that information to the International Narcotics Control Board. The Central Directorate for Anti-Drug Services is a joint organization involving the State Police, the Carabinieri, and the Financial Guard, as well as civil administration personnel from the Ministry of Interior, in the fight against drug trafficking. The three law enforcement agencies are equally represented in the Directorate, with the general director being selected every three years from the three agencies on a rotationary basis. The Directorate was originally instituted in 1976 as the Anti-Drug Directorate, and underwent several changes over the years, until the Interministerial Decree of 1991 defined its current structure and functions. The Directorate is made of three main branches, each containing two Divisions. The General and International Affairs (GIA) branch manages multilateral, training, and legislative initiatives, as well as technical support to the Judiciary Police. International initiatives are coordinated with the United Nations, the European Union, as well as other agencies including the G7 Rome-Lyon Group, the Maritime Analysis and Operations Centre, Ameripol, the Paris Pact Initiative, and the International Drug Enforcement Conference. The GIA branch manages training and educational activities at both a national and international level through courses, conferences, and workshops; and it also gives technical-juridical advice regarding bills and regulations on narcotics and drug trafficking. The Studies, Research, and Information (SRI) branch conducts research and intelligence activities, in particular monitoring national and international drug trafficking. The analysis includes local consumption statistics, trafficking routes, production and market areas, concealment methods, demographics of the people involved, and evolution of new narcotics. At the international level, the SRI branch collaborates with the International Narcotics Control Board. It also gathers and processes information from both national and foreign sources regarding drug-related confiscations, arrests, and deaths, subsequently relaying these data to the National Statistics System (SISTAN), as well as using them for internal reports. Finally, the SRI branch offers support upon request in terms of providing bibliographical references for academic and research purposes. The Anti-Drug Operations (ADO) branch coordinates police activities against drug trafficking through intelligence, strategic, operational, and tecnical-logistical support both at a national and international level. The ADO branch also approves and coordinates undercover operations, manages naval boarding requests against suspicious vessels in international waters, and monitors internet activities related to drug trafficking. Nineteenth century medicine bottles in display at the Hash, Marihuana & Hemp Museum in Amsterdam. In January 2013, Italy legalized the medical use of cannabis with a doctor’s prescription. However, at the time, the cost of cannabis-based medicine wasn’t covered by the State and the drug had to be imported from abroad, primarily from the Netherlands, making it too expensive for the average patient to buy legally at pharmacies, with prices reaching up to 50 € (i.e. about 59 US$) per gram. For this reason, Defence Minister Roberta Pinotti announced in September 2014 that the army would begin growing cannabis plants in a secure room at a chemical-pharmaceutical military facility in Florence. The state-approved cannabis is prescribed for several conditions, in particular for chronic pain relief to patients with cancer and multiple sclerosis, and the army production increased from 20 kg between 2014 and 2016 to more than 100 kg of cannabis in 2017, resulting in a 30% decrease in the cost of the final product. Moreover, in order to keep up with the demand from doctors and patients, the army is also planning to expand its cultivation to other areas of the military facility, where new greenhouses have already been set up in order to reach an estimated production of 300 kg per year. reducing involontary movements for patients affected by Tourette syndrome. The state-run production and distribution of medical cannabis is the result of a collaboration between the Ministries of Health and Defence, as well as other entities including MiPAAF, ISS, the Regions, and qualified experts. The aim is to ensure the availability of the raw material; guarantee the safe preparation and use of cannabis-based medicine; prevent the use of unauthorized, illegal, or counterfeit products; and make therapies affordable by reducing the cost of cannabis. The produced drug is Cannabis FM2 and its THC content (i.e. around 5-8%) is lower than the levels commonly found in similar drugs sold in the black market, or even in those legally imported from the Netherlands, while its CBD content (i.e. around 7.5-12%) is comparatively higher due to its more useful anti-inflammatory properties. The final price of the product being sold to pharmacies by the military facility, based on the estimated production costs and the VAT, is equal to 6.88 € (i.e. 7.39 US$) per gram. Furthermore, in June 2017, the Ministry of Health established a maximum price for medical cannabis between 8.50 € and 9.00 € per gram, in order to standardize the expenses sustained by patients. However, this price cap has resulted in a short supply of the product due to limited profit margins for pharmacies, while regional legislative differences also add to the overall complexity of the cannabis market. For example, the Regions have the ability to increase local prices in order to make it profitable for pharmacies to sell medical cannabis, and they can also decide for which health conditions the drug can or cannot be prescribed. The Ministry of Health also publishes consumption statistics for medical cannabis both at a national and a regional level, based on regional distribution requests and the authorized sale of the product. The annual legal consumption of medical cannabis has grown from 40 kg in 2013 to nearly 10 times that in 2017, and the demand is expected to further quadruple as the value of cannabis is more widely understood by doctors. The high demand caused pharmacies throughout Italy to run out of medical cannabis by September 2017, prompting many patients with prescriptions to turn to the black market, while in January 2018 the importation of cannabis was extended to Canada. The potential revenue from medicinal cannabis is estimated to be more than 1.4 billion euros, with the internal market creating at least 10000 jobs and reducing the dependence on imports. Farmland growing industrial hemp containing minimal levels of psychoactive compounds. In 2016, Italy removed the need for authorization to grow certified hemp with levels of THC below 0.2%, in order to stimulate the production of industrial hemp and to offer an alternative to the cultivation of wheat for farmers damaged by low prices, desiccated lands, and competition from large corporations importing grain from abroad. In particular, the potential profit from the cultivation of hemp in Italy is estimated to be more than 2500 € (i.e. about 2900 US$) per hectare, which is more than 10 times the estimated yield for wheat, and with the increasing number of farmers turning to hemp production, the overall production of durum wheat in Italy decreased by more than 4% in 2017. The cultivation of industrial hemp with minimal levels of psychoactive compounds has several commercial applications, including food, fabrics, clothing, biofuel, construction materials, and animal feed. In Italy, certified hemp plants can be used for both industrial and ornamental purposes, however food products can only be derived from the hemp seeds, since they have no THC content, while the consumption of hemp flowers and leaves is still prohibited. On the other hand, the hemp seeds reportedly contain all essential amino acids in optimal proportions and in a easily digestible form, and edible products include biscuits, bread, flour, anti-inflammatory oil, ricotta, tofu, and beer. The elevated protein content also makes cannabis-based food a suitable meat replacement for vegetarians, while its intense flavour has even been used for gelato, chocolate bars, and pastries. Other hemp-derived products include oils used in cosmetics, thermally insulating ecobricks, pellet fuel, as well as natural resins and fabrics that can be used for clothing due to their thermal properties, and for furnitures due to their resistance. Another significant application of industrial cannabis is soil decontamination through phytoremediation, a process in which contaminants are absorbed by the fast-growing roots of hemp plants, which store the toxins or even transform them into a harmless substance. Examples of applications include the removal of toxic chemical dioxins from farm lands and grazing fields around the Ilva steel plant near Taranto, as well as the removal of radioactive strontium and cesium from areas affected by the Chernobyl nuclear disaster. ^ “Marijuana light legale anche in Italia. Cannabis dove si può comprare”. Affaritaliani.it (in Italian). Retrieved 2018-01-27. ^ a b U.S. Department of Agriculture (1914). Yearbook of the United States Department of Agriculture. p. 297. ^ a b c d e f g h i “Italians can’t get enough of a hemp product that’s illegal to eat or smoke”. The Independent. May 8, 2018. ^ a b c d e f g h i j k “Nasce la New Canapa Economy, aumentano di 10 volte i terreni coltivati”. National farmers association Coldiretti. May 9, 2018. ^ a b c d e f “Is Italy about to legalize cannabis?”. The Local. July 28, 2015. ^ “Italy court strikes down drug law blamed for prison crowding”. Reuters. February 12, 2014. ^ “Italy court overturns law equating cannabis with heroin”. BBC News. February 12, 2014. ^ a b c d e “Italy parliament begins debate on legalizing cannabis”. Reuters. July 25, 2016. ^ “Italian court rules its ‘okay for Rastafarians to smoke marijuana when meditating‘“. The Independent. November 2, 2017. ^ “Rastas can use cannabis, Italian court rules”. The Independent. July 12, 2008. ^ a b c d e f “How and why Italy’s cannabis laws could soon change”. The Local. June 30, 2016. ^ “Italy 3rd in EU for cannabis use”. ANSA. June 7, 2018. ^ a b c d e “‘It saved our business’: Italy’s farmers turn low into high with cannabis”. The Guardian. August 30, 2018. ^ a b “Italian MPs organize to legalize marijuana”. ANSA. March 16, 2015. ^ a b “Italy could make it legal to grow your own weed”. The Local. July 25, 2016. ^ a b “Cannabis light, arriva la stretta: “Se sfora, va trattata come stupefacente““. La Stampa newspaper. September 11, 2018. ^ a b “Il Consiglio Superiore di Sanità dice no alla vendita della cannabis light”. La Repubblica newspaper. June 21, 2018. ^ “Light cannabis and organized crime: Evidence from (unintended) liberalization in Italy”. European Economic Review. 113: 63-76. 2019. ^ a b c “Uso medico della cannabis – Impiego farmaceutico”. The official website of the Italian Ministry of Health. ^ a b “Organismo statale per la cannabis”. The official website of the Italian Ministry of Health. ^ “Ufficio Centrale Stupefacenti”. The official website of the Italian Ministry of Health. ^ a b c “Direzione centrale per i Servizi antidroga”. The official website of the Italian Ministry of Interior. ^ a b c d e f “L’articolazione della direzione centrale per i Servizi antidroga”. The official website of the Italian Ministry of Interior. ^ Marcin, Tim (January 15, 2017). “Marijuana Legalization In Italy: Pot Laws Eased For Growers Cultivating Medical Cannabis”. International Business Times. Retrieved November 19, 2017. ^ “Legal status of cannabis in Italy – an overview”. Sensi Seeds. July 27, 2015. Retrieved November 19, 2017. ^ a b c “Italy: Army unveils ‘cut-price cannabis’ farm”. BBC News. April 30, 2015. ^ a b c d e f g “Medical marijuana made in Italy is ‘impossible to find’. Pharmacies, ‘It’s not worth it‘“. La Stampa newspaper. September 17, 2017. ^ a b “Medicinal cannabis: Italy’s state-approved drug baron shares all”. BBC News. February 10, 2017. ^ “Uso medico della cannabis – Cenni generali”. The official website of the Italian Ministry of Health. ^ a b c d e “Produzione nazionale e distribuzione”. The official website of the Italian Ministry of Health. ^ a b “Marijuana, made in Italy: Inside the military police cannabis lab”. The Local. February 1, 2017. ^ “Canada’s Aurora to sell medical marijuana to Italy”. Reuters. January 18, 2018. ^ “Alberta medical marijuana supplier expands sales to Italy”. CBC News. January 19, 2018. ^ “Cannabis gelato goes on sale in Italian town”. CNN. March 15, 2016. ^ “‘Cannabis’ ice cream whipped up in Italy”. The Local. December 28, 2015. ^ a b “Farmers in Italy fight soil contamination with cannabis”. CBS News. March 12, 2017. ^ a b “Why farmers in Puglia have turned to cannabis”. The Local. June 3, 2016. Italy could be about to legalise marijuana – here are health arguments for and against. International Business Times (UK). Author – Léa Surugue. Published 4 August, 2016. Retrieved 10 January, 2017.